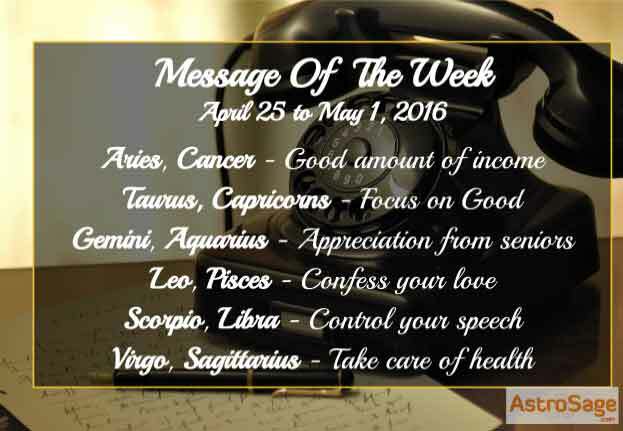 Weekly horoscope for April 25 to May 1, 2016 is here for your zodiac sign based on Vedic astrology. To know how this week is for you, read the horoscope predictions prepared by our expert astrologers. A really good time for you is coming in this week. You will earn good money even from hidden sources. Your brothers or sisters may get you some benefits. Father will be supportive, but you have to take care of your mother’s health. You might have to stay away from your home because of your busy work schedule. However, you have to avoid over-stressing yourself. Love Prediction: This week, Arians have to make lots of efforts in love. Especially, in the initial days of the week, you are advised to be in your moralistic values. By doing this, not only your mid-week will get better, but also you will be able to celebrate your love to the maximum at weekend. Lastly, as per the predictions, staying sober will fulfill all your love needs. Remedy: Avoiding arrogance will provide benefits in many ways, so do that. You will be having great energy and dedication toward your work, but might face some tensions. You have to be bold to handle the situation. Be focused to your work and ignore those who are trying to bring you down. You will have the strength to fight the world, as your partner and father are there for you. Avoid being tough with anyone and spend time with children. Love Prediction: Taureans, the week has arrived giving you mixed results out of your passionate love life. Especially, if you are married then more blissful life is ahead. The week will start in a good way. But, you are advised to behave in a controlled way. In the midweek, you have to stay alert, while weekend will be spent lovably. Thus, overall week can be made better by performing wisely. Remedy: Perform meditation to increase your concentration power. Act calmly and talk to your partner carefully. Take care of his/her health, as some tiffs might occur at home. Your children will take care of you. Colleagues will be supportive at office and you will also be appreciated for your work. You will make good benefits during this time in things related to finances. Love Prediction: Geminis, the week is very auspicious for you. Although, some little naughty fights might occur in between of the week. In the beginning, you might feel distracted toward each other, but the power of love will not get weak. As per the predictions, your good behavior and morality will benefit you. While in the weekend, love will be on track and spirituality in love will be seen. Remedy: Don’t overspend or waste your money this time. You will get profit in your business or your income might increase if the period (Dasha) of any auspicious planet is going on. Legal matters will result in your favor and your life will go on smooth track. Make sure you are not being rude with your brother or sister. Your beloved and parents will be there to guide you in life. Love Prediction: Cancerians, in general, the week might prove to be a little weak in terms of love relation. Lack of transparency results in distrust & a deep sense of insecurity; thus, in this situation, try to maintain that level of trust. Though this week is in favor, but avoid confessing your love at this moment. Mid-week is enjoyable; whereas, you might face some unwanted situations in the weekend. Remedy: Worshiping Lord Shiva will eliminate all the difficulties. You will have things that you want from life. There will be courage in you and your intelligence will let you do things that are right. Your seniors will support in office and those who envy you will fail in their plans. Some religious activities might take place at your home. You will most probably buy a vehicle or house, as the time is in favor. Love Prediction: Lions, this week contains an amalgamation of results. In the starting days, some tensions might surround you. Midweek is auspicious; especially, if you wanna confess your feelings to someone. Lastly, in the weekend, some tiffs with lover are possible, but certainly it will become a medium of bringing warmth in love. Remedy: Worshiping your favorite deity will help in prevailing a positive energy in you. Even though things will go in your favor, you have to take care of your health and drive carefully. It will be good to avoid driving at night. You will enjoy your time with beloved and buy a gift for them. You have to work a little hard if preparing for any competitive exam. Hard work, if done in the right direction, will always result in good. Love Prediction: Virgonians, this week will be a mixture of different outcomes. However, avoid being stubborn and hold your personal desires for a while. Thus, it will help you to fetch goodness in life. Avoid doing anything that will affect your prestige. Initial days are cool, but in the midweek, some estrangements might arrive. Lastly, the fresh breeze of love will be observed during the weekend. Remedy: Drive carefully and avoid anger. Family will have happy time and they are going to stand up for you whenever you need them. You will be feeling enthusiastic, but use this energy in the right direction. Singles might meet the one they have been waiting for. You are suggested to think before making any financial investment. People will respect you. Some good news might come at workplace. Love Prediction: Librans, this week is quite beautiful to make your fantasies come true. But, fulfill them in a controlled way. Arguing is not a communication, it's a noise. Hence, in the beginning of the week, have control over your speech. While, the mid is fabulous, so live like old is gone and new is here. Lastly, enjoy this week to the fullest. Remedy: Avoid bad company and utilize your energy in the right direction. Energy and concentration power is at the peak. You will not feel tired of making attempts and will get great opportunities to excel in life. After some small tiffs in personal life, the week will end on a good note and all pending issues will be solved. Maintain cordial relationship with your colleagues and seniors. Just be focused and things will go fine. Love Prediction: Scorpions, this week will give your heart a break. However, some efforts are also required by you like balancing your personal & professional life easily. As per the predictions, you are suggested to avoid being an emotional fool; whereas, refrain yourself from speaking harsh in the midweek. Therefore, by doing this, weekend will automatically turn balmy. Remedy: Worship Lord Hanuman regularly. People will be impressed the way you present yourself and the way you talk. But, taking care of health is also very important. Seasonal health issues might trouble you, so take care. Your partner might be upset with you, but you will see things will settle down in the ending days of the week. You might go on a relaxed vacation as well. Love Prediction: Sagittarians, the week is fabulous, especially for those who live far away from their love. In this situation, chances are high that they may come to visit you or vice versa. However, initial days may be spent in traveling. But, in the midweek, an emotional satisfaction will be received. Lastly, the weekend will arrive with mixed results. Overall, your true efforts can make week more blissful. Remedy: Perform Yoga and meditation to energize yourself. Promotion, appreciation, and support are in your favor, what else do you want? You can see things are going so nice in your life. Start a new business or anything else and you are for sure getting good outcome. If Dasha (period) of any auspicious planet is there, you will have major profits in this week. Happiness will be there in your personal as well as domestic life. Love Prediction: Capricorns, the week is auspicious, but you have to control your passionate thoughts and tenacity is needed to be controlled. However, beginning is fabulous, but an unknown fear will remain in mind throughout. In the midweek, you might not get a chance to meet, but it won’t affect your love. Comparatively, weekend will be spent nicely, but control on harsh words is required. Remedy: Avoid sensual thoughts and stay restrained. God might bless you with a newborn. Your relationship with life partner will improve and you will get full support of them, both emotional as well as intellectual. If you are planning for a long journey, go out because this time is in your favor. Your expenses will increase, but that does not mean that you will spend on useless things. Love Prediction: Aquarians, the week is special to accomplish your personal desires, provided you have to maintain an equity between work and love. This week, you will be spending a good time with boss or colleagues. Especially, such conditions will be better if happened early this week. Midweek is also waiting with marvelous results. Although, a little care is needed in the weekend. You will go on a vacation with your family and have great time. Social networking sites will take a lot of your time. You have to be careful of what you are saying, as people might get hurt. Financial gains are possible during this week via any new source of income or a new way to earn more. People will be impressed by you. Love Prediction: Pisceans, the week has arrived providing you with the fabulous results. However, sensuous thoughts might be over stressing sometimes. Initial days may become a bit strong spiritually. But, in the midweek, your heart will start beating for someone amongst your colleagues. While, finally in the weekend, chances are high that you may confess your love to him/her. Remedy: Perform charity as per your ability. Today is Sankashti Shree Ganesh Chaturthi. May the divine blessings of Lord Ganesha bring you eternal bliss. On April 28, 2016, Mercury will get retrograde in Aries; and on its next day i.e. April 29, 2016, some people will observe Kalashtami.